Following up on my post about Ann Sack’s basic ceramic tile in 153 colors, I wanted to call out the fact that their extensive range of sizes also includes 4-1/4″ hexagon tiles. And in this other post on Sack’s Elements line, there is a 4″ hex. 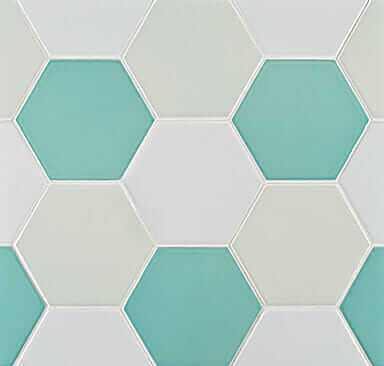 These larger hex tiles are another lovely choice, I think, for a mid-century Retro Renovation bathroom. I am thinking: 4″ hex tile on the floor…. 6″ wide sanitary cove base on the bottom of the wall… a square field tile on the wall… topped by a 2″x6″ bullnose. I’d do all matte finish, I think. Bullnose and sanitary cove are same color… field tile and floor tile the same color or, floor tile could be same color as bullnose and sanitary cove, especially if you want to go white. Your main example is a yummy mix of colors. I’ve loved Ann Sacks almost since I moved to Portland! I’m still here and she has expanded nationwide! Why do I do it? I know there is only so much time in a day and I have more “pressing” issues but, here I am! Browsing and dreaming as I read article after article. OH BOY! Heaven & no doubt about it. I am in the process of bringing my 1957 home back to its former glory. I had to stop for over a year as I battled cancer. My dreams kept me going. I would think “your days are numbered you ole bathroom surround. Just you wait! I am gonna replace you with those little tiles like Kate did in your b.r.” Now that I have my son on-board, we are going to start gutting the bathroom this weekend. Thanks Pam, Kate and the entire Retro Renovation Family for your enthusiasm, ideas and suggestions. I will make sure to share my before and after pics with you.